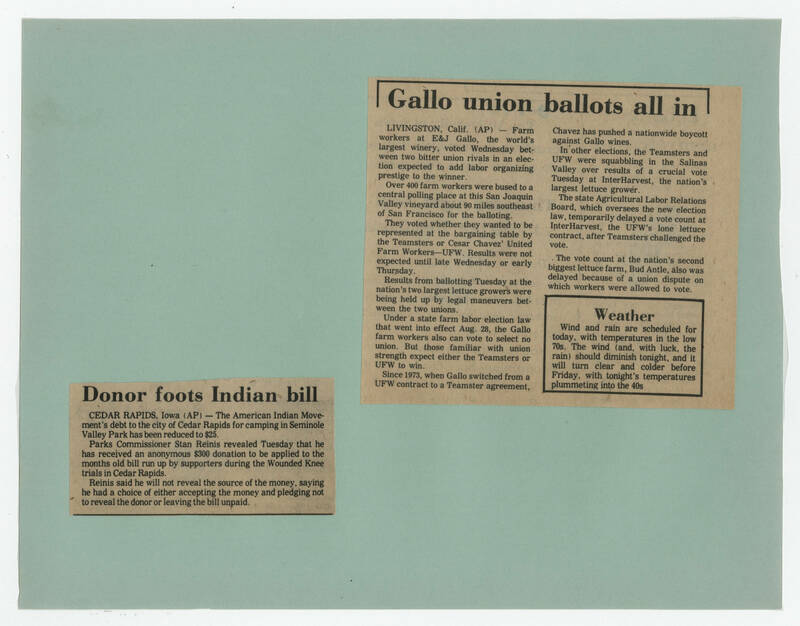 [[Header]] Donor foots Indian bill [[end header]] [[Article text]] CEDAR RAPIDS, Iowa (AP) -- The American Indian Movement's debt to the city of Cedar Rapids for camping in Seminole Valley Park has been reduced to $25. Parks Commissioner Stan Reinis revealed Tuesday that he has received an anonymous $300 donation to be applied to the months old bill run up by supporters during the Wounded Knee trials in Cedar Rapids. Reinis said he will not reveal the source of the money, saying he had a choice of either accepting the money and pledging not to reveal the donor or leaving the bill unpaid. [[Header]] Gallo union ballots all in [[end header]] [[Article text]] LIVINGSTON, Calif. (AP) -- Farm workers at E&J Gallo, the world's largest winery, voted Wednesday between two bitter union rivals in an election expected to add labor organizing prestige to the winner. Over 400 farm workers were bused to a central polling place at this San Joaquin Valley vineyard about 90 miles southeast of San Francisco for the balloting. They voted whether they wanted to be represented at the bargaining table by the Teamsters or the Cesar Chavez' United Farm Workers--UFW. Results were not expected until late Wednesday or early Thursday. Results from the ballotting Tuesday at the nation's two largest lettuce growers were being held up by legal maneuvers between the two unions. Under a state farm labor election law that went into effect Aug. 28, the Gallo farm workers also can vote to select no union. But those familiar with union strength expect either the Teamsters or UFW to win. Since 1973, when Gallo switched from a UFW contract to a Teamster agreement, Chavez has pushed a nationwide boycott against Gallo wines. In other elections, the Teamsters and UFW were squabbling in the Salinas Valley over the results of a crucial vote Tuesday at InterHarvest, the nation's largest lettuce grower. The state Agricultural Labor Relations Board, which oversees the new election law, temporarily delayed a vote count at InterHarvest, the UFW's lone lettuce contract, after Teamsters challenged the vote. The vote count at the nation's second biggest farm, Bud Antle, also was delayed because of a union dispute on which workers were allowed to vote. [[In box]] Weather Wind and rain are scheduled for today, with temperatures in the low 70s. The wind (and, with luck, the rain) should diminish tonight, and it will turn clear and colder before Friday, with tonight's temperatures plummeting into the 40s.